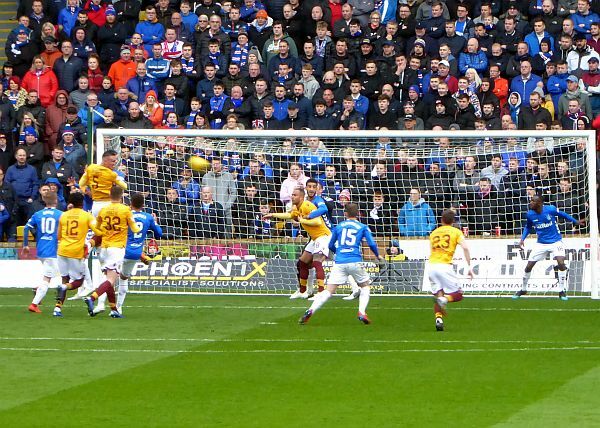 Rangers left Fir Park with three points and three Scot Arfield goals as the Mothewell defence made a series of costly errors to present the visitors with an easy win. It started so well for Stephen Robinson’s young team. There was plenty of positive possession as we set about passing our way to the South Stand penalty area and for the opening twenty minutes we played the better football. Then came the mistakes and we paid the price. Mark Gillespie passed a late fitness test and took his place in goal. Alex Rodriguez Gorrin was restored to midfield in place of Carl McHugh. The confident start belied what was to come. We took the game to Rangers and seemed able to make progress on both flanks. Jake Hastie’s pace on the right was balanced by the clever footwork of Gboly Ariyibi on the left. David Turnbull and Alex Gorrin found space and control in the middle and Campbell buzzed everywhere. We pressed quickly when possession was lost. It all looked good. Tom Aldred hesitated as Defoe’s pass crossed the 18 yard line and Arfield was on hand to pounce. It was the first threat on our goal and with the first quarter gone we lost the first. Charles Dunne elected not to clear from deep but to give Turnbull a short pass. Defoe was on the midfielder in a flash and with the defence out of position Arfield was presented with a simple finish. All the early good work was undone. There was to be no miraculous turnaround n the second half. On the hour another defensive mix up let Defoe lay the hat-trick on a plate for Arfield. In truth we were fortunate that not all of our mistakes were punished. Hastie got our only shot on target but his effort following his cut in from the right was easily held by McGregor. Chris Cadden, Elliott Frear and James Scott came on but their fresh legs were unable to find a consolation and we ended the game well beaten.